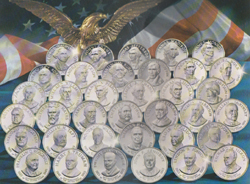 The American Bicentennial Medals Collection (Franklin Mint, 1976) Current Market Value. This series of 12 medals portrays the most important events of July 4, 1976 -- the 200th birthday celebration of America's independence. The events are depicted as they happened, all across America. The series was available exclusively to established Franklin Mint collectors. The edition was minted in 18KT Gold (84 mintage) and Sterling Silver (4,675 mintage), and was issued in 1976.